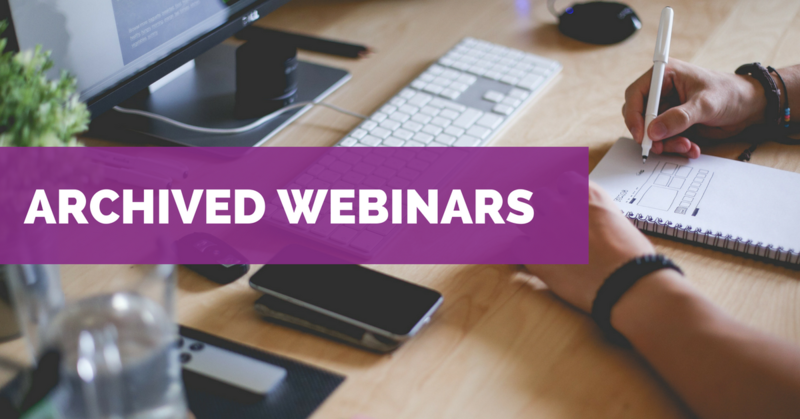 We conduct webinars featuring expert national, state, and local presenters on a wide range of topics. Click on the tabs below to find archived webinars by subject area. Last year, Sesame Street Workshop launched a national initiative on family homelessness to bring awareness and support to young children and their parents who are homeless, and those who serve them, including early childhood programs, schools, and service providers. Lily, a sweet and resilient 7-year-old muppet whose family experienced homelessness, is featured throughout the new resources, which include a storybook, videos, activities, and other materials for providers. This webinar will provide an overview of the resources, insights into how they were created, as well as examples of how practitioners are using them to raise awareness, reduce stigma, and provide support to children and families experiencing homelessness. This webinar will highlight the ways in which Child Care Resource & Referral (CCR&R) Agencies and early childhood and housing providers are working together to increase participation of young children experiencing homelessness in early childhood programs. National and state leaders and local CCR&R staff will share information on trends and resources being used to build capacity, engage families, enroll children and support providers. Emphasis will be on partnering across provider systems to better understand community needs and implement comprehensive strategies to ensure success. This webinar will cover how Head Start programs and LEA McKinney-Vento liaisons are working together to better serve children experiencing homelessness and their families. The webinar will include a description of regulatory requirements for Head Start and LEAs to address the educational needs of children experiencing homelessness, as well as provide practical examples of how Head Start and LEAs are partnering with one another and templates for more formal Head Start-LEA working agreements (MOUs). Research shows that approximately 1.1 million children have an 18- to 25-year-old parent who experienced homelessness during the past year. The instability associated with homelessness can have a profound impact on childhood development and on the health and well-being of parents, so it is critical to connect young parents with programs that can meet both their needs and those of their children. This webinar will provide an overview of the common challenges faced by young people who are pregnant or parenting while experiencing homelessness, and will share the experience and expertise of drop-in services, early childhood development providers, and residential programs that have successfully partnered to serve young families experiencing homelessness. Families experiencing homelessness face unique barriers to accessing quality child care; yet without quality child care, parents struggle to find and keep the employment they need to maintain housing, and the health and development of children are compromised. It’s been four years since Congress passed the Child Care and Development Block Grant Act of 2014 with specific requirements for states on families experiencing homelessness and two years since the release in 2016 of the CCDF Final Rule providing guidance to states. Join this webinar to find out what lessons have been learned, and how should these lessons inform states’ CCDF State Plans for 2019-2021 due June 30, 2018. This webinar will provide descriptions of how states have gathered input into their planning process for serving families experiencing homelessness and ways they are progressing toward implementing policies and practices given their unique state resources and structures. Implementation can often involve state legislative action, redesigning contracts, regulatory changes, extensive training, etc. Learn about the provisions in the CCDF Plan Preprint 2019-2021, and find out how you can weigh in on your state’s planning process to improve child care for some of our nation’s most vulnerable children and their families. An estimated 1.2 million children under age 6 experience homelessness each year. Homelessness in early childhood has been found to be associated with delays in language, literacy, and social-emotional development, putting children at risk for later academic problems. Early childhood programs can ameliorate these effects. Yet homelessness creates unique barriers to accessing and participating in early childhood programs. This webinar will share information about early childhood programs that may be available in your community, including what they provide and how to find them. Then, a school district early childhood program administrator and a McKinney-Vento liaison will share their practical strategies for collaboration, streamlining enrollment, and working with families. Families experiencing homelessness face unique barriers to accessing quality child care; yet without quality child care, parents struggle to find and keep the employment they need to maintain housing, and the health and development of children are compromised. It’s been four years since Congress passed the Child Care and Development Block Grant Act (CCDBG) of 2014 with specific requirements for states on families experiencing homelessness, and two years since the release in 2016 of the CCDF Final Rule providing guidance to states. What lessons have been learned, and how should these lessons inform states’ CCDF State Plans for 2019-2021, due June 30, 2018? This webinar will present new research on how states have served families experiencing homelessness, as well as insights from several states about what they have done, and what they plan to do. With an historic $2.37 billion increase in CCDBG funding – the largest increase in child care funding of all time – it is especially important to learn about the provisions in the CCDF Plan Preprint 2019-2021, and find out how you can weigh in on your state’s planning process to improve child care for some of our nation’s most vulnerable children and their families. Pregnancy, parenting, and homelessness put youth at significant risk of dropping out of high school. Lack of a high school degree, in turn, is significantly correlated with homelessness: new research finds that youth without a high school diploma or GED are 4.5 times more likely to experience homelessness; that youth who are pregnant or parenting are three times more likely to experience homelessness; and that more than one in three unmarried homeless young women is pregnant or parenting. These findings are especially alarming because homelessness in early childhood can have lifelong consequences. Helping young parents graduate from high school, and making sure that their children participate in quality early care programs, are essential to preventing future homelessness and promoting long-term economic independence. This webinar will provide an overview of educational protections and services for homeless young parents and their children, and highlight successful strategies at the state and local level. Practitioners will share lessons learned and how to build partnerships for supporting parents and children. An estimated 1.2 million children under the age of six experience homelessness. Homelessness and trauma are inextricably connected. Traumatic experiences change the way children’s’ brains are wired. But adults hold the power to help lessen its effects. It helps when children feel seen and heard by a caring adult and someone patiently teaches coping strategies and resilience-building techniques. Your friends at Sesame Street have created resources to help caring grown-ups like you mitigate the effects of traumatic experiences in the children you care for. In this webinar, we’ll walk through our latest initiative, Sesame Street in Communities, and explore a selection of these resources to help you bring these protective factors to life. The Every Student Succeeds Act of 2015 (ESSA), the Head Start Program Performance Standards, and the Child Care Development Fund regulations contain new requirements for identifying and supporting young children experiencing homelessness. This webinar will provide a brief overview of these policies as well as practical suggestions for implementing them at the local and state level. School district and state education agency leaders will describe the steps that they have taken to put policies into practice, and offer suggestions for adapting and replicating these practices to support our youngest children experiencing homelessness. This webinar will be of benefit to early care and education professionals, as well as to family homeless and housing professionals. Muchos niños, jóvenes y familias no tienen una vivienda estable. Han perdido su casa, o no tienen dinero suficiente para mantener su hogar. Se quedan en las casas de otra gente, en moteles, en refugios, y a veces afuera. No importa dónde duermen, estos niños y jóvenes tienen el derecho de inscribirse en una escuela, de quedarse en la misma escuela mientras se cambian de un lugar a otro por las noches, y de recibir apoyo para que puedan participar y tener éxito en su escuela. En esta charla, se explicarán estos derechos y el apoyo disponible, además de contestar preguntas de los padres y estudiantes sobre los derechos de educación en general. Esta charla será grabada para que se pueda escuchar después. What are the impacts of an out-of-school suspension for a student without a home? Where do they spend their day? What do they eat? Who cares for them? Research has shown the effectiveness of positive school discipline for all students, but it has particular relevance for students experiencing homelessness. At the same time, research also shows that students experiencing homelessness are disproportionately suspended and expelled from school. This webinar will discuss the importance of trauma-informed practices in school discipline and the benefits of school-wide positive behavior support. Two McKinney-Vento homeless liaisons will share their replicable strategies for ensuring positive approaches to discipline for students experiencing homelessness and how their strategies have impacted students and schools. Most importantly, a student who experienced homelessness in high school will share the trauma-informed practices she uses in her current job and the importance of these practices for youth. Both the Every Student Succeeds Act and the Foster Connections to Success and Increasing Adoptions Act contain provisions designed to help students in foster care remain stable in school and have the support they need to succeed in school. This webinar will explain the basics of these provisions. Three state-level experts will talk about how they are implementing the laws in their states, with strategies and sample procedures you can replicate in your school district, child welfare agency, or state. Learn more about how child welfare agencies and schools can work together to help students in foster care graduate high school and transition into higher education. Size matters: large, urban school districts face many challenges in supporting students experiencing homelessness–but not every large school district has over one million students like New York City Public Schools. Still, of the more than 13,000 school districts across the country, the 100 largest districts enroll anywhere from 50,000 to 650,000 students and share many of the same struggles serving students experiencing homelessness. From identification to transportation and early childhood through high school graduation, learn how three large urban school districts have implemented the McKinney-Vento Act to help children and youth find educational success. Presenters will share strategies suitable for large school districts, as well as information that may spark ideas for districts of all sizes – including unique partnerships with higher education, housing agencies, and other community-based organizations. This webinar is a “refresher” on the basics of the education of children and youth experiencing homelessness, intended for those who have some familiarity with the issues but would like to brush up for the new school year. We’ll review the education subtitle of McKinney-Vento, as well as Title I Part A provisions related to homelessness. Topics include determining eligibility; identifying students experiencing homelessness; school of origin; immediate enrollment; preschool and early childhood; strategies to support high school graduation; and the transition to post-secondary. We’ll highlight new resources along the way, and leave plenty of time for questions and answers. There are more than 1.3 million students in our country’s public school system with no safe place to call home. If you suspect or discover that a student in your classroom or school is experiencing homelessness, you may wonder what you can do to help. This webinar will discuss the basics of the McKinney-Vento Homeless Assistance Act–the primary federal law that protects the educational rights of students experiencing homelessness. We’ll share helpful demographic data about this vulnerable population, explain the effects of homelessness on student achievement, and walk through best practices in getting students to graduate from high school. This webinar will empower educators new to the issue to both better understand their students’ needs and support their day-to-day and long-term achievement. When the McKinney-Vento Act, Every Student Succeeds Act, and Individuals with Disabilities Education Act (IDEA) face off in a preschool or school, which law wins? This webinar will discuss the intersection of these three laws and how they work together in practice, from preK through high school. We’ll address questions such as surrogate parents for unaccompanied youth and children in foster care, evaluating students who have missed a lot of school or whose achievement may be impacted by homelessness or foster care, immediate enrollment for students with Individualized Education Programs (IEPs), transportation, private schools, and everyone’s stickiest question: who pays? Unaccompanied homeless youth face unique barriers in accessing financial aid. This webinar will provide homeless education professionals, higher education professionals, and community-based organizations with information and tools to assist homeless youth to apply for Federal Student Aid. Presenters from the U.S. Department of Education’s Office of Postsecondary Education and the Office of Federal Student Aid will discuss financial aid policies and practices for homeless youth. Presenters from SchoolHouse Connection will provide a brief background on unaccompanied homeless youth, and review requirements in the Every Student Succeeds Act (ESSA) that support the transition to post-secondary education. School counselors and social workers provide important support to students experiencing homelessness, helping meet their basic needs and planning for graduation. The Every Student Succeeds Act recognized this role by adding requirements that counselors advise students experiencing homelessness and improve their readiness for college. In this webinar, we’ll hear tips and strategies from a young person who experienced homelessness in high school, a current high school counselor, and a school social worker. We’ll also unveil a new, 2-page tip sheet for counseling staff, developed specifically in response to requests from the field. Come with your questions and learn from the experts. New research finds that without a high school diploma or GED, youth are 4.5 times more likely to experience homelessness as young adults than their peers who completed high school, highlighting the role of education as a critical intervention to prevent future homelessness. 2018 marks the first year for which all states are required to track graduation rates for students experiencing homelessness. This requirement shines a light on the unique challenges faced by students who are homeless, as well as on the success that is possible when the right supports are provided. This webinar will feature lessons learned from one state and three school districts that have made significant progress in raising graduation rates for students experiencing homelessness. Get ideas for strategies to support students experiencing homelessness to graduate from high school – a necessary prerequisite for stable employment, higher education, and a better future. Can I give a list of my McKinney-Vento students to a housing program? Can we share educational documents with a non-relative caregiver, foster parent, or foster care caseworker? What about an unaccompanied student who doesn’t want her parents to see her school records? This webinar will go over the basics of FERPA, the Family Educational Rights and Privacy Act, focusing on the top questions related to homelessness and students in foster care. Native youth have the lowest high school graduation rate of students across all schools. Nationally, the American Indian/Alaskan Native high school graduation rate is 69%, far below the national average of 81%. Native Americans also disproportionately experience homelessness. Current and historical trauma contributes to disproportionately high rates of poverty, domestic and other violence, and other challenges, leading to homelessness. In this webinar, experts will share their experiences and practical strategies for serving Native American students experiencing homelessness. ESSA’s amendments to the McKinney-Vento Act require that states have procedures to ensure that McKinney-Vento students “who meet the relevant eligibility criteria do not face barriers to accessing… extracurricular activities.” This new provision adds to longstanding requirements to remove barriers to enrollment (including full participation in school activities) and retention in school. Join the experts in a discussion of strategies to ensure full participation for all our McKinney-Vento students, including unaccompanied youth. We’ll review the law and hear strategies from a State Coordinator, the Assistant Executive Director of her state’s interscholastic activities association, and the liaison who inspired our “Making the Case” tool on extra-curricular participation. Federal rules on immigrant youth and families are changing rapidly, from Deferred Action for Childhood Arrivals (DACA), to the rights of sponsors caring for immigrant youth, to enforcement actions by Immigration and Customs Enforcement (ICE). This webinar will provide the latest information on rules, rights, and responsibilities for undocumented students, sponsors and families. An immigration attorney will outline do’s and dont’s for schools serving immigrant students, and a McKinney-Vento liaison will share her practical strategies to help students and families. The McKinney-Vento Act is a powerful law, but it cannot help students who are not identified as eligible for its protections. In this webinar, McKinney-Vento liaisons and State Coordinators will share best strategies for identifying eligible students. The Every Student Succeeds Act’s amendments to Title I now are in effect, and there are several important changes to improve the availability and use of Title I funds for students experiencing homelessness. This webinar will review the law and share practical strategies from the state and local levels to calculate Title I set-asides, use funds creatively and appropriately, and track data. Join us to learn from peers and get your questions answered. The Every Student Succeeds Act of 2015 (ESSA) places unprecedented emphasis on high school graduation for students experiencing homelessness. In this webinar, SchoolHouse Connection staff will review new legal requirements in Title I and the McKinney-Vento Act on issues such as credit accrual, full participation, transitions to college, and data. Then, school district homeless liaisons will share their practical suggestions for implementing these policies, with a specific focus on partial credits and alternative diplomas. Most importantly, students will share how these practices make a real difference for students struggling to overcome homelessness through education. This webinar reviewed key topics in McKinney-Vento Act implementation, as amended by the Every Student Succeeds Act, including identifying students experiencing homelessness; school of origin; immediate enrollment; strategies to support high school graduation; and preschool. We reviewed the law and implementation strategies. Learn about the EMBARK statewide network in Georgia. Hear from three Georgia homeless higher education liaisons about their roles and responsibilities. Many institutions of higher education provide resources and on-campus support to students experiencing homelessness. Community-based organizations outside of college campuses, too, are beginning to focus on the needs of homeless youth in higher education. This webinar highlights partnerships between colleges and outside supportive services that work to promote student access and success. We’ll hear from three organizations from across the country to learn how they support college students and their relationships with colleges. Homelessness and housing insecurity are emerging as important issues in higher education. Although often invisible, emerging research suggests that lacking stable housing has a direct and significant impact on persistence and retention. This webinar highlights some of the largest studies that explore how college students experience housing insecurity and provides promising practices for how postsecondary institutions can respond to student needs. The overarching goals of the webinar are to first share findings from their research and connect those ideas to a definitional framework for understanding how housing insecurity and homelessness manifest in higher education settings. Further, researchers and practitioners will discuss how to incorporate a trauma-informed approach to working with students. Finally, presenters will provide a current campus program model developed to support students experiencing lacks in their basic needs. One of the best practices in supporting homeless college students is having a specific individual to support these students. Many institutions across the country have incorporated this practice of a homeless higher education liaison or single point of contact (SPOC), similar to the K-12 McKinney-Vento Liaisons. California in particular has state legislature (AB 801) that requires the California Community College and California State University systems to designate a Homeless Higher Education liaison on their campus. This webinar features three homeless higher education liaisons representing all three California systems, their roles and responsibilities under AB 801, best practices in supporting homeless college students, and considerations of implementing this role on a college campus. We look forward to continuing this conversation with other homeless higher education liaisons across the country in Learning from Higher Education Liaisons: Best Practices in Supporting Homeless College Students Part 2. One in five Community College students in Los Angeles experiences homelessness. In response, a non-profit housing provider for homeless youth is taking its resources onto community college campuses to directly house homeless students. Learn how Jovenes, Inc. (www.jovenesinc.org) is partnering with schools like Rio Hondo College to reach out to homeless students and how housing support is helping homeless students succeed in school and life. This webinar is designed to help participants develop actionable ideas to connect homeless students to housing resources in their local communities. In September, two important pieces of legislation were introduced in Congress to promote higher education success for youth experiencing homelessness and youth in foster care, “Higher Education Access and Success for Homeless and Foster Youth Act” and “Fostering Success in Higher Education Act.” These bills seek to address barriers to higher education access and success by streamlining access to existing financial aid, enhancing assistance and support for retention and completion, and improving collaboration, outreach, and data collecting. Opportunities are also provided for institutions to establish or expand statewide initiatives to assist foster and homeless youth in enrolling in and graduating from institutions of higher education. When housing and education systems work together, outcomes for children and families can improve. This webinar will present an overview of public housing authorities and the programs they administer, and highlight two school district collaborations with housing authorities that are focused on children and families experiencing homelessness. Practitioners will share strategies for approaching partners, and how to sustain relationships to ensure comprehensive services are provided for short- and long-term success for children, youth, and families. As liaisons, social workers, educators and service providers, our work should be informed by research and the lived experiences of children and youth. This webinar will bring recent research to life as three SchoolHouse Connection Young Leaders reflect on Chapin Hall’s Missed Opportunities research and their own experiences. They will discuss key findings from the research; how these issues impacted their K-12 and higher education; and insights for changes in policy and practice. Voices of Youth Count (VoYC) is a national initiative designed to fill gaps in the nation’s knowledge about the scope and scale of youth homelessness, as well as the life circumstances and experiences of runaway and unaccompanied homeless youth between the ages of 13 and 25 years old. Join NN4Y for a webinar discussion with the Principal Investigator of Voices of Youth Count, Dr. Matthew Morton. VoYC is an unprecedented initiative to understand, address and prevent youth homelessness. Chapin Hall has conducted the most comprehensive research to date on youth homelessness, incorporating youth voices to develop achievable solutions. This research creates a foundation on which we can build solutions – effective policies and practices – to end homelessness for young people. Two young people, one who has graduated from college and one who is in the second year of a degree program, will share their tips for schools and service providers on how to identify youth who are experiencing homelessness, keep them engaged in and attending school, and work with them as true partners to get them to high school graduation and into (and through) post-secondary education. They will identify the challenges they have faced, and continue to face, as a result of experiencing homelessness, and describe the efforts that have been the most successful for advancing their academic careers and life goals. The webinar will include ample time for Q&A and conversation. A new Congress means new members and new committee assignments — and, in the case of the U.S. House of Representatives, a new majority. In addition to addressing completing federal funding for the rest of the current fiscal year following the recent partial government shutdown, the 116th Congress will continue to work on new legislative areas, annual matters like annual budget and appropriations legislation, as well as other legislative matters that were not resolved in previous Congresses. With family and youth homelessness at unprecedented levels across the nation, the stakes are high. In this webinar, we’ll review pending or anticipated legislation related to child, family, and youth homelessness, including services, housing, early care, and education. We’ll also look at the committees and members with greatest influence, and discuss strategies for engaging them on youth and family homelessness. This webinar will provide an overview of our state advocacy methodology. Starting with surveying young people, service providers, liaisons and other stakeholders, we identify state policy barriers. We then convene advocates to discuss state policy barriers and engage in a series of group activities that leave the attendees ready to engage in state policy advocacy united behind a shared agenda on youth homelessness. This webinar will share our surveys, suggest key stakeholders to include in advocacy, provide a sample State Advocacy Institute agenda and the activities we use in our trainings, and share strategies to engage young people in advocacy from the beginning. We also will address restrictions on “lobbying” and how to be sure your advocacy activities do not cross that line. Efforts to advance the Homeless Children and Youth Act, HR 1511/S 611, have picked up in recent weeks. This important bipartisan legislation would make it easier for communities to help children, youth, and families who experience homelessness, no matter where they happen to be staying. Over 50 national groups and hundreds of community-based service providers have endorsed the legislation. Find out what the bill does and does not do, why it is critically important to addressing youth and family homelessness, and what you can do to help advocate for its passage. Get the facts in this special webinar co-hosted by Family Promise, First Focus Campaign for Children, National Network for Youth, and SchoolHouse Connection. The recently enacted FY2018 federal funding bill includes historic increases in funding for homelessness, housing, and education programs. Congress will now turn its attention to the FY2019 budget. Learn what’s next in the budget process, as well as updates on the newly re-introduced Runaway and Homeless Youth and Trafficking Prevention Act, the Homeless Children and Youth Act, and the Higher Education Access and Success for Homeless and Foster Youth Act. This webinar will provide the latest updates on federal legislation related to child, youth, and family homelessness. Topics to be covered include the FY2018 budget; two new bills to improve access to higher education for homeless and foster youth; the reauthorization of the Runaway and Homeless Youth Act; the Homeless Children and Youth Act (HUD Homeless Assistance reform), and the AHEAD Act (school-housing partnership legislation). Learn about the latest developments, get your questions answered, and find out what you can do to help.